kyaa haal-haal hai saaron kaa? 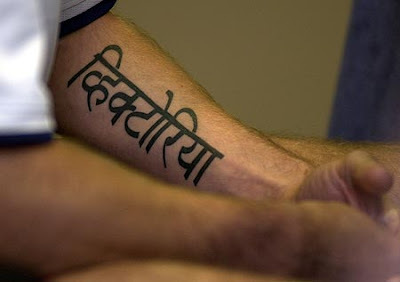 Now that we here all know Devanagari script, we can have some fun reading the awful Devanagari tattoos people get! Let's start with David Beckham's VHIKTORIYA tattoo. Hey, it's more "meaningful" because it's written in Devanagari, right? Post your own funny examples! Vhi... this first latter is more looking like khi. No? How 'khi' woulf look? If the first consonant contains a vertical line with nothing to the right of it (like व or स), the vertical line is removed, and the remainder is joined with the next consonant. If the consonant contains a hook on its right side (like क or फ), the hook is shortened and joined to the next consonant.